Thanks to the kindness of virtual strangers, and the Philadelphia Eagles' trick play in the Super Bowl, villagers in a Ugandan village now have access to safe drinking water at a new spring well. Clement to Burton to Foles. That's the version of the "Philly Special" that nobody who watched Super Bowl LII will ever forget. Sure, local chatter is currently focused on whether (or likely not) Trey Burton will return to the Eagles next season. But Doug Pederson's gutsy – nay, legendary – call has made a huge difference for people in a small Ugandan village thanks to the generosity of a pair of locals. Adam Bruckner, the man (and heart) behind Philly Restart and Helping Hand Rescue Mission, doesn't confine his giving to youths and homeless adults in Philadelphia. To hear Bruckner tell it, he has a habit of taking unusual last-minute trips to the globe's neediest corners to see how he can help. In February 2017, one of those voyages took him to a Haiti, a country in worse shape than he even imagined. He made his way to an environmental commune where he met Shilpa Alva of Surge for Water, a Chicago-based non-profit that "invests in communities through safe water and sanitation solutions to help end the cycle of poverty." Bruckner said he had seen television footage of water-poor villages in Africa, but didn't think those dramatically scored commercials translated to "kids actually drinking that water." Alva told him that was the reality of the situation. Then, a couple months later, an unfortunate set of circumstances in Philly created a fortunate avalanche of events for people in Kaberamaido in eastern Uganda. "I went to a bank on Girard (Avenue) and locked my favorite bike up outside and let my guard down. I was only inside for a couple minutes, but when I got back outside, someone had clipped my bike. It was gone," Bruckner explained on Monday afternoon. "It was only a couple hundred dollar bike. "Obsessed is the wrong word, but I went all over and I was going to steal my bike back if I found it." He didn't locate the bike, but the mission led him to find something more important: The need to shake the badness that enveloped his mission and turn it into something good "to get the stupid bike off my mind." He called Alva and told her he wanted to sponsor a water project in Uganda. She said you have to come over to see it. So, in August, he flew to Kampala, Uganda and took a 7-to-10-hour van ride (depending on traffic) to Kaberamaido. According to Surge for Water, just 1 percent of Kaberamaido's 230,000 residents "has piped water." Few residents have electricity and many suffer preventable diseases caused by the contaminated water they walk miles to get. "When you make that trip, you quickly understand why people don't have clean water," he explained. 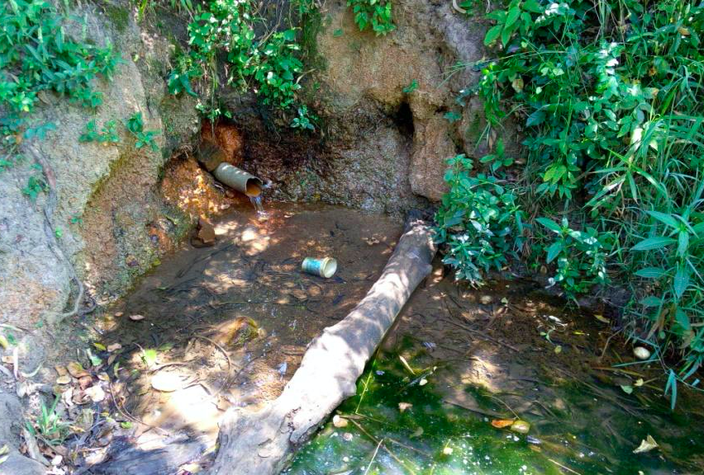 Before the $2,500 investment, the water spring was dirty and subject to spreading disease to those who drank from it. He connected with villagers through soccer, which is natural since he played professionally and was an assistant coach with the Philadelphia Kixx. He also got to see firsthand the dire situation as it pertained to drinking water. "It was terrible. People were bathing, washing their farming boots, in the drinking water," he said. "We see tough situations in Philly, but it's such a different world. We have cleaner toilet water than what they drink every day. "I didn't want to ask people to help unless I'd laid eyes on it myself." After 10 days in Uganda – in a village more than 7,000 miles away from Philadelphia –he'd seen enough and asked his friend Ron Zeitz to help, which he did to the tune of $2,500 which has gone quite a long way. Teaming up with Surge for Water and Prince of Peace for Orphans and Widows (POPOW), they focused on a mud-hut community of 906 people that had been devastated by an outbreak of typhoid fever. 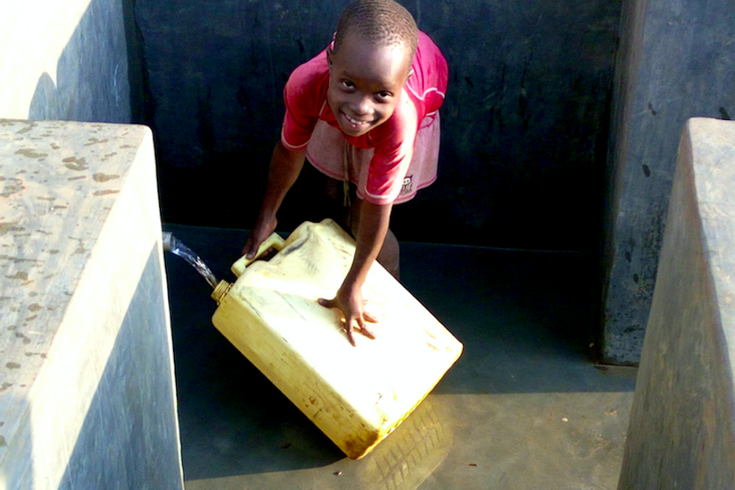 The fundraising covered the costs of a water engineer, cement and a basin water-collection unit. There, a spring coming up out of the ground has been transformed into a spring well from which villagers get their drinking water. The well opened in February. Bruckner was able to see the opening in images sent via POPOW's dial-up computer and digital camera. Sure, the work started before the Super Bowl, but the trick-play tie-in was a must. "Dedicated to Burton to Foles. Philly Special," reads a plaque at the spring. Yes, the Philly Special play that brought so much joy to Eagles fans has also brought much-needed drinking water to an African village in dire need of it. Bruckner explained the tie-in: Agreeing to run that play on fourth and goal just before halftime of the Super Bowl, Pederson's craziness spoke to "the beautiful nature of a guy with reckless abandon." "Everybody wants to win and is afraid to lose," he said. "He stepped out of that and took it on himself. He was willing to take fault." 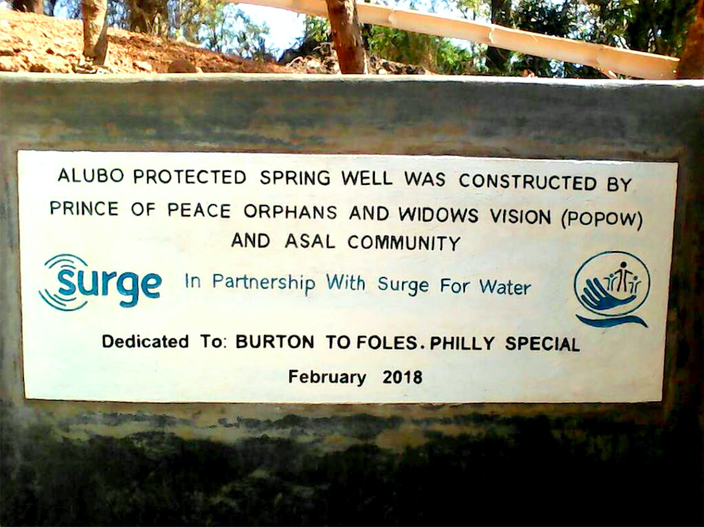 A protected well in a village in Uganda is dedicated to the 'Philly Special' trick play that entered Philadelphia Eagles lore during Super Bowl LII. Zeitz obviously bought into that pitch. "It's remarkably affordable for something that changes a village so much," said Bruckner, who plans to return to Uganda this summer to see how the well has helped. "It's really embarrassing; the whole village comes out and throws a parade when a visitor arrives." And what will he say at the end of that parade? "I'll give a speech about the 'Philly Special,' about how the Eagles were underdogs and how villagers' lead underdog lives," he said. "People might not believe in you, but we do."